Never use cooking spray or non stick spray on non stick cookware. The spray will degrade the non stick coating and eventually it will no longer be non stick. Never ever use metal utensils on non stick cookware. And that means no flipping sides with a metal turner, no stirring with metal spoon, no picking up food with a metal fork, and definitely tell yourself “no” when you find that little voice saying “just once”. Although you might want to wash the non stick cookware immediately to avoid food caking on, don’t run the cookware under water when it is still hot. This will cause the pan to warp and damage it. Try to resist washing your non stick cookware in a dishwasher. Most manufacturers advise against this as well because the high temperature in a dishwasher will damage the non stick coating. Washing non stick cookware in a dishwasher might also void the warranty. To get dried food off, mix baking soda with warm water to make a paste, and rub it onto the pan with a dish cloth or sponge. Really stubborn residue can be removed with elbow grease. Just remember not to use steel wool, scouring pads or stiff brushes to wash non stick cookware. Washing the cookware twice in a gentle manner will work as well as washing it vigorously once. Use only dish detergent that is gentle enough for your hands, no harsh solutions or cleaning agents. Always protect the non stick surface from being scratched. Store the cookware by hanging it on a pot rack, or if you don’t have one, try to keep it on top of the stack. If you can’t do that too, place a clean dish towel on the surface before stacking something else on it. Taking careful steps to care for your non stick cookware will prolong their lifespan and keep up their performance, giving you the best value for your money spent. Copper cookware is expensive, but known for its amazing heat conductivity that will let you control the temperature precisely. Many professionals use copper cookware for its quick and uniform heat to cook with perfection. But copper cookware is also known for its beauty. 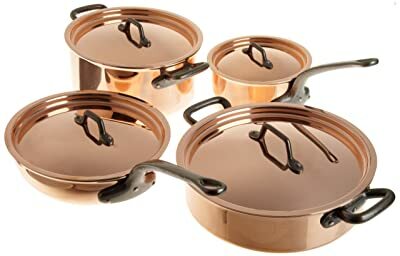 When you take the whole set of copper cookware out of the box, you might even feel reluctant to use them because they shine so nicely in your kitchen! Don’t worry, here are some tips for you to keep that pretty shine even after a lot of use. Copper is a curious material that will discolor if it is highly exposed to heat and water. So since cookware is exposed to both all the time, you will need to take some action to bring back the shine. If you like the natural patina on the cookware that develops over time, just remove the stains with hot soapy water. For stubborn marks, apply ketchup or tomato paste on the surface and rinse off after a few minutes. Use 1/4 cup of vinegar and 2 tablespoons of coarse salt to make a paste. Rub this paste onto the copper surface of the cookware with a soft sponge or dish cloth. Then rinse it off with hot water. Polish your copper cookware with a proprietary cleaner like Radiance or Never Dull. Copper cookware are usually lined with other metal such as aluminum or stainless steel. If they are, only apply the above methods on the copper surface. Clean the lining the normal way. Don’t use abrasive scourers on copper cookware, like stiff brushes and steel wool. The surface will be scratched. Don’t wash copper cookware in a dishwasher if you can help it. Even if you don’t care about copper cookware looking good, it’s important to keep it from discoloring too, because if the copper develop dark blotches it will become hot spots that will burn the food that is cooked. Cast iron cookware are great for cooking because they are inexpensive, durable, and high heat resistant. If you are willing to spend time to care for your cast iron cookware, it will give you delight in cooking for generations! When you get the new cast iron cookware, you’ll need to season it before the first use, unless it came pre-seasoned, like those by Lodge Logic. Scrub the cookware thoroughly with soap water and an abrasive sponge. Dry it with a paper towel and then let it sit on a burning stove until it is bone dry. A simple way would be to pour a bit of cooking oil to coat the surface and leave it for a few minutes, then wipe off the excess oil with a paper towel. If you want to be more thorough, coat the whole cookware with oil (take care not to burn your fingers if it’s hot), then place it in the oven bottom up, and switch on the oven to 350 degrees F. Let it bake for an hour and then leave it to cool in the oven before removing it. Season your cast iron cookware regularly to keep it a better ‘non stick’ than coated cookware. Iron will rust when it is exposed to water. But this doesn’t mean you cannot wash your cast iron cookware. You can wash with soap water and don’t use abrasive scrubbers unless you are planning to season it right after. Remember never to soak it in water, soapy or otherwise. After washing, immediately dry it with a paper towel and let it sit on burning stove until it is dry all over. Store cast iron cookware without the lid on to avoid condensation which will cause rust. If you store them in a cabinet, I suggest storing them together with a roll of paper towel. The paper towel will keep the humidity low. If you find rust on the cookware, scrub it off with shortening, and remember to season it afterward. Don’t run a hot cast iron cookware under the tap. It’ll break! Always leave the cookware to cool before washing them. Don’t store food in cast iron cookware. It’ll destroy the seasoning and the iron will leak into the food causing it to taste metallic. It’ll also cause rust. Don’t use cast iron cookware to cook acidic foods like tomatoes and food with citrus fruit juice (lemon juice, etc.). The food acids will destroy the seasoning. Don’t wash your cast iron cookware in a dishwasher. They cannot be soaked in water, remember? Keep these in mind and your cast iron pans and pots will last you forever.